Even if you aren’t setting out to have a theme for your wedding celebrations, the time of year can usually impact on the general mood and tone of the event. 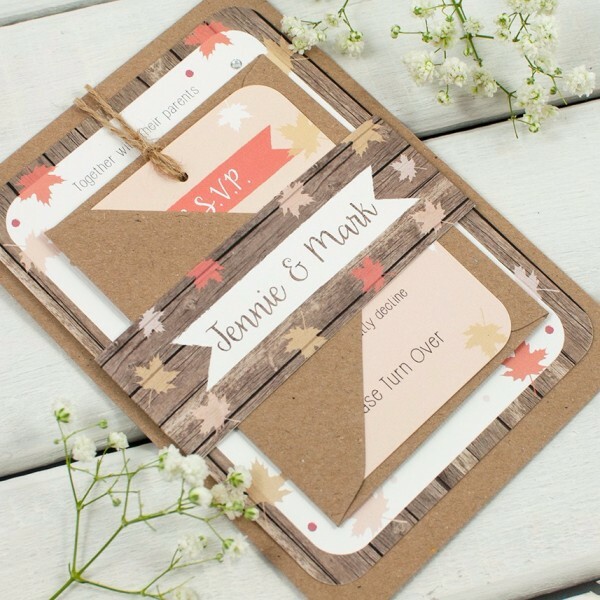 This means that couples who are having an autumn wedding will find that opting for a wedding invitation that draws on the feel of autumn is a smart move. First of all, it lets people know when the wedding is taking place, allowing them to plan ahead. However, given that autumn is a beautiful time of year with glorious colours and foliage, you can see why many couples will opt for this sort of style for their wedding. There is a gloriously rustic charm to the autumn leaves wedding invitation bundle and the mixture of coral and blush plays well with the wooden backdrop for the card. The wooden theme runs throughout the bundle and there is a patterned wooden bellyband which draws the package together while the card and RSVP tag is finished off with rustic twine. You may find that the nature and appearance of the wedding invitation is so charming that you incorporate some of the elements in to your big day. There is an added attraction to this invitation with the addition of hand applied gems and pearls. This provides a unique touch to the invitation, making this the sort of wedding invitation that will receive a special place in the homes of your invited guests. With rounded elements and matching envelopes to round the bundle off in style, this is the sort of wedding invitation set that makes having an autumn wedding very appealing. Order from Norma & Dorothy. Tags: Coral, Gems, Leaves, Pearl, Rustic, Twine, Wooden.